One of my favorite parts of this time of year is receiving Christmas cards. I check the mail every day, hoping to get a photo greeting from family and friends. The only problem with this fascination is their display. We don't have a mantle, so that's out. My husband doesn't like clutter on the refrigerator, so I can't hang them there. Adding to the dilemma is that I want them in a place where I can keep them year-round without getting in the way. Then it dawned on me. A family tree! We have a long hallway in our lower level that would be perfect for a simple tree made from yarn, tacks, and pushpins from which the photos of loved ones could hang by paperclips or binder clips. This week, my vision was put into action and I love it! It makes me pause as I walk to the laundry room to see a tree filled with people I love. It's visible, yet out of the way. Perfect. My blank slate, waiting to be filled! Here you can see the construction. 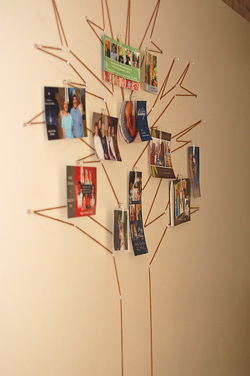 I used thumbtacks for the angles in the tree and pushpins for mostly endpoints where I'll hang the photos. 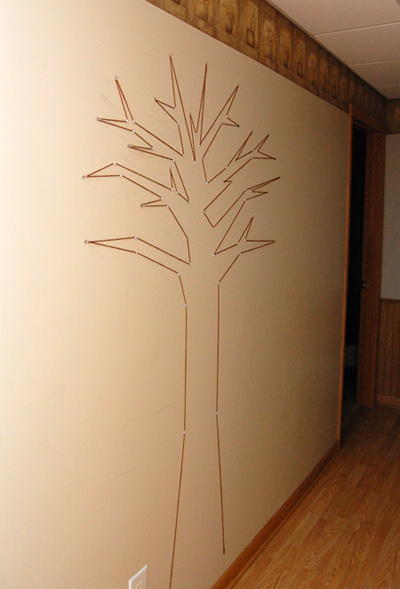 One helpful hint is to put your pushpins in first based on the distance you need for hanging photos. 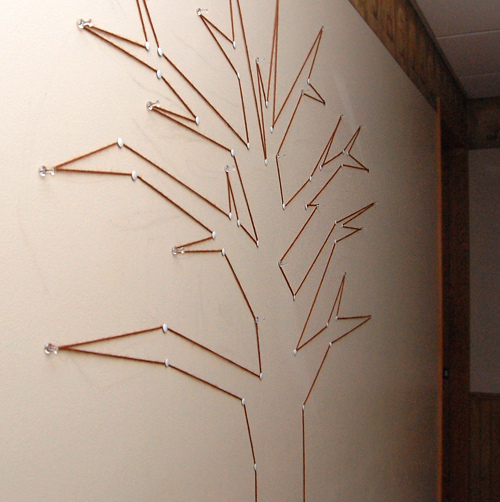 Then create your branches around them. While this tactic made my trunk a little funky, once it's covered, the funkiness is reduced. What about you? How do you tackle incoming Christmas greetings? Are you a designer or something? :) Very cute. Growing up we always taped the cards around doorways, so we've continued that tradition. Christmas guests love looking at them, too! 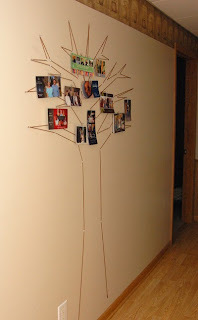 I've also seen cute little table-top trees with clips on the ends of the branches that can be used for Christmas card display or other photos year round.